If you are looking for where to stay in Porec, we have exciting news to share with you- we've got our own villa in Porec. If you are looking for a villa in Porec, please consider staying at our place. It is a 3-bedroom, 3-bathroom secluded villa with a 1000 m2 of landscaped garden, and 30 m2 swimming pool. Before you decide on where to stay in Porec, we would like to share with you our best tips. Old town Porec is mostly car-free, and thus difficult to park your car. It's also where majority of bars, restaurants and attractions are, so you'll always find it bursting with people. Depending on where you stay within the old town Porec, you can also experience some morning noise with garbage trucks, and cleaners starting their works early in the morning. However, if you don't travel by car, old town is a good place to stay, as all major sights, as well as few beaches, are within walking distance. Old town is also a good choice if you plan to stay in Porec up to three days. In this case, being in old town will give you a chance to easily visit all major sights without losing your time on transport. Consider staying in old town Porec if you don't travel by car, if you plan to stay in Porec up to three days, and if you don't mind street noise. Residential areas east of downtown: Multi-story family houses line streets here. Houses are very close together, and generally don't offer much privacy. Expect also some traffic noise. However, proximity to downtown and supermarkets make these neighborhoods attractive to renters. Borik, Spadici and Materada: Located north of old town, these neighborhoods are mix of residential and resort areas. Borik is within a short walking distance. You'll find here apartments and hotel Pical Porec, hotel Zagreb, a number of vacation rentals. Spadici and Materada are further north, but you can still walk to downtown. Here you'll find residence Pinia, hotel Pinia Porec, hotel Materada, hotel Laguna Park Porec, camping Materada, and lots of vacation rentals. Tourist train also connects these neighborhoods with the town. While town is a bit away, a short walking distance to the sea makes these neighborhoods attractive to tourists. Brulo: Brulo neighborhood is also a mix of residential and resort areas. It's within 15-minute walk from the old town, and only 5-minute walk from the sea. A nice walking and cycling path, as well as electric tourist train, connects Brulo and downtown. This is a good area to stay if you look for a beach vacation. You'll find here hotel Diamant Porec, Rubin, Crystal, and hotel Mediteran Porec, and holiday rentals in private houses. Zelana and Plava Laguna: These two resorts are 5 km south of the old town. They consists of hotels, apartments, and campsites. All properties are run by Laguna Porec. Resorts also feature restaurants, bars, sport facilities, and beaches. Walking and cycling trails, as well as tourist train, run between these resorts and downtown. If you look for a beach vacation, these resorts will suit your need. Hotel Delfin Porec is good for a budget stay. For us the best places to stay in Porec are actually small villages in town's surroundings. In these villages you'll mostly find private accommodations: apartments, villas, holiday homes, and B&B. These properties usually offer better value for money, more privacy. Villages are quieter and you'll simply get better night sleep. Our favorite villages around Porec include Mugeba, Veleniki, and Kukci. Check B&B Korta Gira, and Castello Rausch to get a feel of what kind of accommodation you can expect in villages near Porec. Where To Stay In Porec Croatia Croatia | Porec Travel Blog | Pin Me For Later! Traffic is limited in old town. Hence, you need a permit to enter the old town with a car. Downtown hotels keep few parking spots in the old town, but not enough for the number of guests they accommodate. Some hotels, like Valamar Riviera, or Palazzo, allow car access only for a check-in purpose, and then you'll need to re-park at designated parking area out of the town. Parking is free for hotel guests, and hotels also provide a shuttle that brings you back and forth. If you rent an apartment in Porec old town, you'll need to take care of your own parking. While hotels in outer neighborhoods offer free parking for all hotel guests, private apartments in Porec usually provide limited parking in front of the property, so in high season, when all spots are full, you might need to use street parking, or park at some of Porec parking lots. When choosing a place to stay in Porec, double check if the property provides free parking. If you are ready to pay more for a centrally located Porec accomodation, in order not to use car during your stay in Porec, the truth is – you'll probably still need a car. Town's various neighborhoods spread across wider area, and some of them are still over 1 km away from the nearest beach. Although theoretically you stay within a walking distance from the old town, or town beaches, on hot summer days, you'll certainly use a car to move around. When in doubt should you value location over attractiveness and the price of the place to stay in Porec, always choose attractiveness and price. Especially as places out of the town provide parking, and you'll never fight for it after you get back from the beach or town. Many hotels in Porec offer half-board (breakfast and dinner) in the price of room. This can be a great saver for budget-conscious travelers. On the other hand, Porec apartments are fitted with fully-equipped kitchen. This means you can save while cooking your own meals. Generally you'll get a better deal if you stay in apartments than in hotels, In hotels, you'll get more service like breakfast, dinner, daily cleaning, and room service. If you decide to stay in hotels in Porec, we find that generally Valamar hotels are better looking than Laguna hotels, and they offer great buffets. In fact, Valamar Hotels are famed for great choice and good quality buffet food. Laguna hotels might be cheaper in high season, though. Porec abounds in hotels, campsites, private apartments and villas. Below is an overview of the best places to stay in Porec: from hotels, hostels, campsites, private apartments and villas. Two Croatian hotel chains, Valamar Hotels & Resorts, and Laguna Porec, own and operate majority of hotels in Porec. Besides, these two big hotel chains, you can also find few small, family-run boutique hotels. Some hotels, although not many, are located in downtown, while majority of hotels are scattered along Porec Riviera; from Zelena Laguna to the south to Materada neighborhood to the north. Perfect for couples and city-dwellers who want to be in the center of action, Valamar Riviera Hotel & Residence is conveniently located at Porec waterfront. This 105-room boutique hotel features an excellent à la carte restaurant Spinnaker, a lounge bar with a lovely outdoor terrace, beauty and massage parlor. In-room amenities include flat screen satellite TV, a mini bar, coffee and tea maker, and a complimentary WiFi. Free boat transfer to the island of St. Nikola is available for hotel guests. Valamar Riviera Hotel & Residence is known for serving the best buffet breakfast in the town. Price starts from 80 € per double with breakfast. Check here for more info and latest prices. Hotel Valamar Isabella is a part of a Valamar Isabella Resort, opened in 2015, on a tiny island of St. Nicolas. Valamar Isabella Resort consists of a 4* hotel, villas, studio apartments and a castle. Island of St. Nikola is just a short 5-minute boat ride from downtown Porec. This is the place to stay in Porec for families with children, but for couples as well. The properties spreads across the island, having an active family-oriented zone around hotel Isabella, and a relaxed zone for couples around the Castle Isabella on the west side of the island. Family-friendly hotel features 180 Superior and Family rooms, ranging from 23 m2 to 68 m2. All rooms have balcony, terrace or loggia. In-room amenities include flat-screen satellite TV, mini bar, safe and a complimentary WiFi. Baby equipment (baby cot, bottle warmer, etc.) is available on request. Hotel also features an active heated outdoor pool, and a baby pool, small wellness center with indoor pool, a buffet restaurant Isola and a trattoria Vista. Prices start from 90 € per night for a double room with half-board. Located at Porec's waterfront boardwalk, boutique hotel Mauro features 21 rooms and an à la carte restaurant with nice outdoor terrace. In-room amenities include flat-screen TV, mini bar, bathrobe and slippers, complimentary WiFi internet, and a safe. Staff is friendly and genuinely caring. The rooms are well-furnished, clean and comfortable, although a bit smallish. Prices start at 89 € per night for a double room with breakfast. Built in 1910, the Grand Hotel Palazzo Porec has been refurbished in 2009 back to its 20th century glory. Located at the tip of the peninsula, in Porec Old Town, the Hotel Palazzo Porec is surrounded by the sea. Rooms are comfortable, and clean. Superior rooms are more expensive but also more spacious than Classic rooms. Hotel features a small outdoor pool, wellness center, shops, a restaurant, and a popular Cafe Del Mar serving drinks, cakes and ice cream. Prices start from 82 € per night for a double room with breakfast. This 4-star property is just minutes walk from the old town. Recently renovated, hotel Zagreb Porec features 230 rooms, all with its own balcony, WiFi, flat-screen TV, minibar, and air-conditioning. We find hotel Zagreb to be a bit under the radar, and it often offers much better deals than other hotels in Porec. Food at breakfast and dinner is great, and included in the price of room. Prices start at 100 € a night for a double room with a half-board. Renovated in 2012, hotel Parentium Porec quickly became one of the most sought after hotels in Porec. Hotel Parentium Porec is locate din Zelena Laguna Resort, on a small peninsula, overlooking the sea, and a marina. It's location is really superb, and a bit secluded from the rest of this busy resort. Hotel features 268 rooms, it has a large airy lobby, a lovely outdoor swimming pool, and nice beaches around. It's surrounded by thick pine forest, and it offers lots of shade during hot summer days. Rooms are slick and modern. Make sure you book a room with a balcony. Prices start from 105 € a night for a double room with breakfast. This budget hotel is located in a historical building at the Porec waterfront. Rooms are outdated but all have high ceilings and a sea view. Breakfast is served at a 4-star Valamar Riviera Hotel. This is a huge plus for anybody staying at the Jadran Residence. Free boat ride to and from beaches on the island of St. Nikola is available for hotel guests. A popular Porec bar – Epoca is located at the ground floor of the Jadran Residence. Prices start from 41 € per night for a double room with breakfast. Since we started renting our own apartment in Porec, we became more aware of pros and cons of apartments in Porec. I don't want to go deep into it (I could write a whole post about it), but I need to tell you that you really need to look closely what you rent. We noticed that people really look to rent apartment in downtown, and discard right away apartments in the vicinity of Porec. I, on the other side, would never stay in downtown Porec, even if they pay me. My reasons? It's crowded. It's noisy. Parking is a hustle. Many apartments are outdated. And if they are new, they are much more expensive than ones out of town. Also, even if you stay in downtown, you'll most probably need a car to go to the beach. Because, what's difference if you stay in downtown, but 1 km from the beach, or out of Porec, 5 km from the beach. Will you really walk with all your beach equipment in 35 degrees on a sunny summer day? Don't even kid yourself, because, you simply won't do it. However, if you really insist on downtown apartment in Porec, we've got a couple of good ones to recommend below. Goran, our good friend, owns these apartments, along with his family. He now lives in Zagreb, and rarely visits during the summer. But, his sister and brother in law (also Goran :-)) run the property, and are great hosts. And really nice people. Their Urban Premium apartments, located in a quiet residential area of Porec, are modern, comfortable and well-furnished. Each apartment consists of one bedroom, fully-equipped kitchen with a dining area, a living room, a bathroom and a terrace. This lovely, and brand new apartment in Porec, belongs again to one of our friends. This time, to Ivan, Vera's colleague from work. You'll find it in a residential neighborhood of Porec, in a quiet street lined with family houses, and friendly neighbors. The apartment is spacious, located on a top floor of their family house, with lovely balcony and nice views over the town, and all the way to the sea. It's only 15-minute walk from the old town. The Little House is a lovely one-bedroom cottage located in Matulini, a small village 12 km east of Porec. Guests can relax in a large garden with a 60 m2 outdoor pool. This is adult-only property, and it can accommodate max. 2 persons. 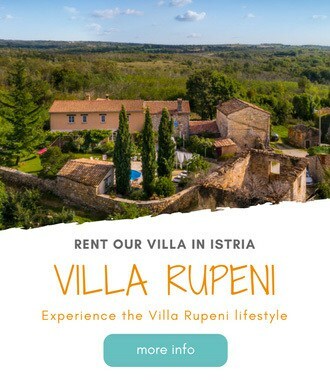 Nicky & Phil, a couple of Brits who made Istria their home, own and run The little house. And finally, our own apartment in Porec, Frank's Place, is located in a small village of Barbici, just 5 km northwest of Porec. The apartment is brand new. It consists of one bedroom, full-equipped kitchen with dining area, a living room, bathroom, and a balcony. Our apartment is air-conditioned. A private parking spot, and a WiFi are provided free of charge. Find out more info on Frank's Place. Villas in Porec are wonderful choice for your stay in Porec. These villas come with plenty of perks, like private pool, garden with BBQ, trampoline for kids, and alike. Villas in Porec offer privacy, and seclusion. You'll find majority of Porec villas in the villages up to 15 km away from Porec. This is our own villa which we bought in October 2016. You'll love its tranquil surrounding, far from the hustle and bustle, but yet only 15 km away from Porec, and 30 km away from Rovinj. The villa has three bedrooms, and three bathrooms; two of them are en-suite. The garden is beautifully landscaped, and it features a private pool. We also love covered patio in the back of the house with a BBQ, and outdoor dining area. This is amazing villa in Porec, with stunning, modern design, and less than 3 km away from downtown. Villa accommodates up to 8 people, in four bedrooms. Two bedrooms have en-suite bathroom. Villa has a private pool, and a lovely garden. Check here for additional info and latest prices. Camping has always been very popular type of holidays in Porec. In fact, Porec has one one of the largest, and best campsites in all Croatia, like Camping Lanterna, and Camping Bijela Uvala, who both got German and Dutch auto-clubs “Best campsite” award for many years in a raw. Porec campsites are large, well-maintained, and clean, with great infrastructure including modern toilets, large outdoor swimming pools, a variety of restaurants, and bars, and a good sport offer. Average plots size is 120 m2 and most plots have an electric and water hook-up; some plots also provide drainage. Camping in Porec means camping by the sea, as all campsites are located along the Adriatic coast. Camping Lanterna is the largest camping in all Croatia. It covers an area of 83 hectares, and it can accommodate up to 9.000 people at once. Besides plots where you pitch your own tent, or park your own camping van, Lanterna also offers a variety of rental accommodations, like mobile homes, and our favorite – glamping tents. There are in total 14 luxury tents. Tents are 36 m2 big, and each consists of two bedrooms, full kitchen, full bathroom with shower and a large outside deck. There is also a shared swimming pool, available exclusively for guests of glamping tents. If you dream of sleeping under canvas, but having a full comfort of a home, then Safari Tents in Bijela Uvala camping might just be a right choice for you. These safari tents come with two bedrooms, full-equipped kitchen (including even a full size fridge), full bathroom, and a covered patio. I haven't stayed in these tents myself, but they are on my walking route, and I often wonder what would it be like to spend a night here. There are about 20 tents, forming a small village within a campsite. Tents face one another, and while it can be intimidating for someone looking for a bit of privacy, it can also be a great way to meet fellow glampers. Check additional info and latest prices here. Zelena Laguna is our favorite camping in Porec. It's the closest campsite to the town (although it is 5 km away from downtown). Funnily enough, with an area of 18 hectares, and almost 1.000 camping plots accommodating almost 3.000 people, it's also one of the smallest campsites in Porec (that's how large campsites in Porec are!). The campsite is beautifully landscaped, especially common areas. Thick forests cover most of the site, giving plenty of shade to camping plots. Bushes between plots clearly define and separate one from the other. Toilets are plenty, and very clean. In addition, there are lots of beaches all along the coastline. Beaches are pebbly, and rocky with sunbathing platforms and easy access to the sea. Swimming pool is also available, as well as various restaurants, bars, sport facilities, and entertainment for children and adults. Lovely seaside walking and cycling trail, as well as electric tourist train, connects the campsite with the rest of Zelena Laguna resort, and with a village of Funtana (through camping Bijela Uvala). What's your impression of accommodation in Porec? What kind of accommodation do you fancy? Let us know in the comments below. So lovely! But are there beaches that are easily accessible if you are staying in old town? Camping sounds great, I’m glad you included it in your post! Not something I find readily in posts that cover accommodations. thanks so much for reading! Camping is great in Croatia, and we love it too. How are your travels going? I’ve seen that you’ve been to North Korea recently. Cool!